The story of America’s true greatness is told in leather and steel, in adventure and industry. From the leather boots, hats and saddles of the Wild West as America’s territory expanded to new frontiers, to the steel factories, hard work, good jobs and peerless production of the 20th century that made America a superpower, the story of the United States was written by these two mighty materials. 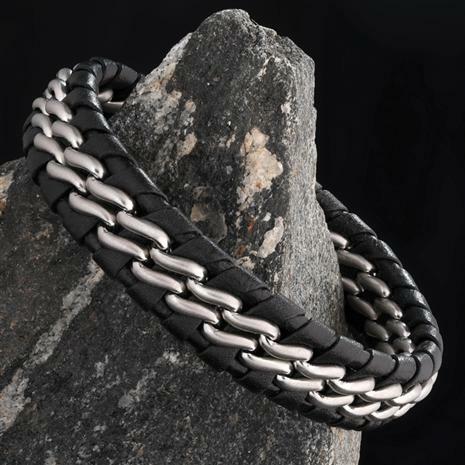 We’re proud to offer the Men’s Leather Patriot Bracelet, made from America’s two essential elements. The supple but sturdy banded black leather of the men’s bracelet is matched and complemented by the bright inlaid links of incorruptible stainless steel, held steadfastly together by a reliable slide-lock clasp. The Patriot Bracelet is a stylish way to celebrate your commitment to the spirit and character of this country while gaining your economic advantage by doing business with Stauer.